At The Pennsylvania State University, the Department of Communication Arts and Sciences houses a state-of-the-art laboratory facility for conducting interaction and experimental design studies. The lab includes several rooms: a control room for unobtrusive monitoring of interaction, a controlled-environment briefing room to minimize distractions, a modern interaction space to simulate naturalistic conversations, and a conferencing space for conducting group interaction research or focus group discussions. The interaction room is outfitted with a couch, a comfortable table setting, and a divider so that the space can be partitioned. 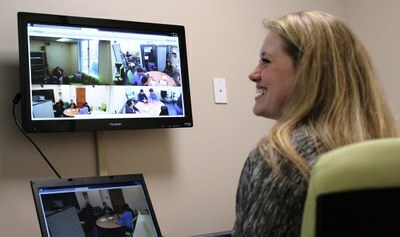 Researchers have the ability to record from up to five camera angles at once, allowing a 360 view of the conversation. The Communication Research Lab has a variety of high-quality portable and static audio and video recording equipment available for use, as well as department-owned information storage and computing equipment. Feel free to contact the Research Coordinator as casrepass@psu.edu with your specific needs. 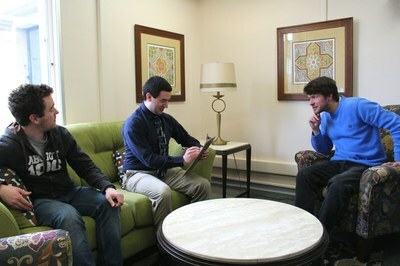 The Communication Research Lab can be reserved for use by contacting the Research Coordinator at casrepass@psu.edu. Priority of use will be determined based on the needs of applicants and the timeliness of applications for use. Researchers in the Department of Communication Arts and Sciences, including faculty and graduate or undergraduate students who are working with faculty supervision, can apply to draw research participants from the Department research participant pool or RePaSS. Researchers using the RePaSS system contact participants via dedicated research software that maintains consistent communication with participants.